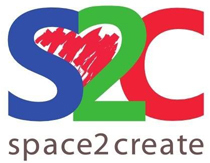 Space2Create runs a number of varied sessions through the week. 2Create uses creative activity to support anybody suffering or recovering from long term physical or mental illness. It is also ideal for anyone feeling lonely or isolated by their circumstances no matter what the cause. Sessions are easy going and relaxed with mutual support from all as most in the group share common difficulties. The groups are fun, full of chatting and there is no pressure, you can be as involved as you feel able to. The creative activities cover a wide range of art often looking at the work of an artists and finding out about different media and techniques. Sessions take place every Tuesday morning from 9.30 til 12.00 Studio 31 at The Factory. We provide all materials and refreshments. We ask for a £3 donation. The Thursday Group is a craft based creative session making a wide variety of items from many media. Session leaders have ideas and themes they explore or people make their own work. The group members do rag rugging, seasonal crafts, junk jewellery, knitting, sewing and a host of other craft ideas. The group also attend craft fairs and shows around the county to sell and promote Space2Create. Sessions are relaxed and informal, allowing participants to focus on making. The group is mutually supportive, relaxed, friendly and inspiring. Sessions run on Thursday mornings from 9.30 till 12.00 Studio 31 at The Factory, £3 donation,materials and refreshments included. Space2Create have been running creative sessions on the Westmorland General Hospitals Mental Health Ward for over a year. Every Wednesday afternoon between 2pm and 4pm for the inpatients of the ward. The sessions are a valuable relief for those there helping them to get through the day, having time and space to join a creative activity. The sessions also provide a link to the outside world. When individuals are discharged from the ward many attend sessions run during the week by Space2Create where they find familiar faces and support from the volunteers. Please note: The Photography Group is having a break at the moment though we hope to start up again soon. Please keep checking back to see when our next meeting is. The Photography Group meet monthly on different days, times and places depending on the project. See below for details of the next meeting and a gallery of shots from our last meeting. The group is relaxed and friendly. No matter your level of skill or equipment, we support and advise each other mutually. We plan to visit a wide range of locations around the local are so keep checking the website here, and our Facebook page for details of the next meeting. Next Meeting : To be confirmed. WellArt is a very creative group that works closely with Lakeland Arts Trust at the Abbot Hall Art Gallery. The group makes regular visits into the gallery for new exhibitions and does creative work in the gallery occasionally too. We do all sorts of creative work in many different media often inspired by the gallery exhibitions and other artists work. We also from time to time invite practising artists in to run sessions in their area of expertise. You do not need any skill as individuals in the group can work at their own level. All materials are provided and the group is very friendly and mutually supportive. WellArt meets every Friday morning from 9-30 till 12 at Studio 31. We ask for a £3 donation. All materials and refreshments provided. We have no group leader at the moment for creative writing so the group has stopped running for the moment. We are actively seeking somebody to take this on again and will advertise when we have new sessions lined up. like the force of my emotion. Crash in waves that build and fade. Holding brief forms to evaporate. Furiously expanding with power and energy. Desperately scratched in inky abandon.